The technology has left notable influence on the agriculture too, manifested from the industries relying upon the material handling automation to boost the productivity and ultimately profit. The continuous processing of the agricultural yields is continuously being processed through the conveying system and hence it must be of the highest quality that can pledge high performance at lower cost. Owing the requirement of thereof, we as a conveyor belt manufacturer carry off the best in class gamut of the conveyor belt for agriculture. This gamut of the conveyor belt is developed employing the food grade PVC/PU material that is accredited by the FDA bodies to make it truly reliable alternative for the variegated agriculture yields, be it grain, nuts, seeds, fruit, vegetables or other parallel agriculture outputs. Further, the material on the PVC conveyor belt for agriculture is water, heat, cold resistant and hence best for any type of environments. 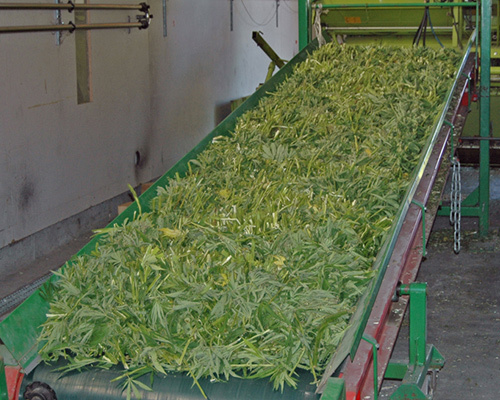 Besides that, the design of the conveyor belt for agriculture depends upon the type of application, for a while, the design is different from the little steeple angle to the large one, which is our expertise that enables us to deliver the right solution for your need that can ensure 100% effectiveness. The entire manufacturing executes under the stringent quality control, and undergoes the strictest quality checks against international quality parameters that promise high performance at low cost. Cleats, sidewall and all other alternatives are available with the flat or patterned conveyor belt for your requirement at lower cost and hence we are reckoned as the one stop solution provider for your conveyor belt for agriculture need.